It has been 5 years since Virtua Fighter 5 vanilla was released on consoles. Since then there have been 2 new updates to the game. 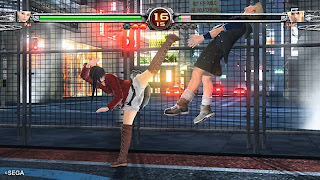 Virtua Fighter 5R was released in Japanese arcades only, never to see the light of day on any consoles. A valiant effort was put forth by many fans from the USA in the form of a 500 page petition to get the game in some form onto American shores. I was among the ten thousand plus signatures. The petition was hand delivered to Sega in person and for a while it seemed like they merely glanced over it and filed it away. 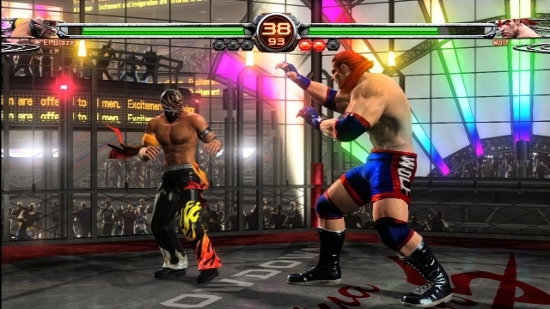 A few months later the announcement of Final Showdown was revealed and that it WOULD see a console release. A full year after testing in the arcades, Sega revealed it would be a digital download release at the low price of $15 for both the PS3 and Xbox 360. So 5 years we waited and finally received the latest update for Virtua Fighter 5, but how does it hold up? 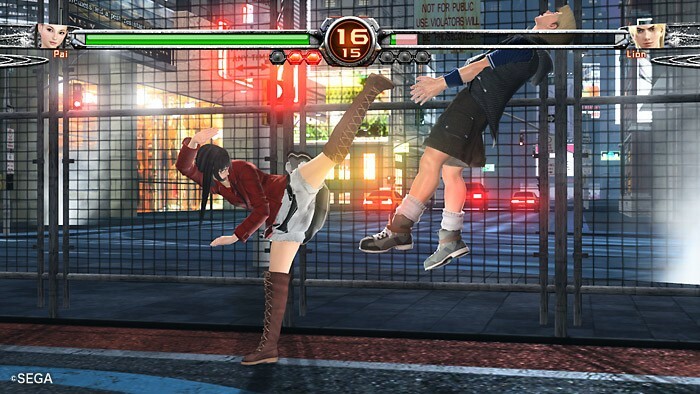 So as one would expect, Virtua Fighter has had numerous revisions for each release. A ton of gameplay mechanics were changed, musical presentation was improved, two new characters were added and they completely overhauled their online play feature. They also improved their already incredibly robust training mode. However there was some features removed that definitely keep this from being a complete success in my book. As fighting games go, usually there’s a story connecting with the theme of their game. Street Fighter 2 started this with 8 different endings almost all connecting to the main villain, Bison. However when the VF series came out, there was absolutely no emphasis on a story structure. 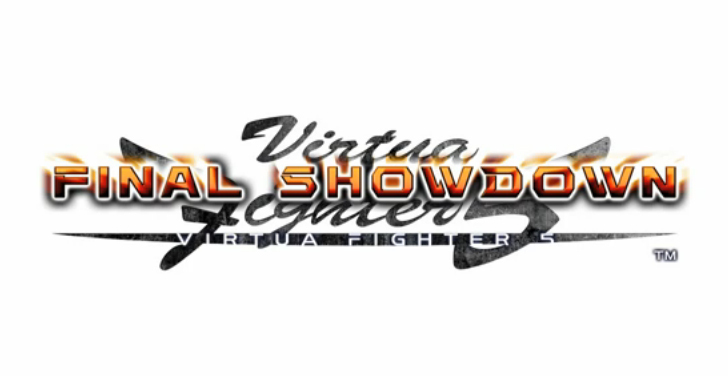 However that doesn’t mean one doesn’t exist in the Virtua Fighter 5 Final Showdown. Pretty much the game revolves around the concept of a weapons company running a tournament and gathering the world’s greatest fighters. Upon having the fighter there, they extract data and use it to create a super soldier. There are individual stories for each character but honestly you wouldn’t have known that if not for the game’s instruction manual. The plot really has no hold on how the game plays out save for the final boss, Dural, who is the supposed super soldier. Sega really doesn’t put a strong emphasis on the story because they really want you to concentrate on the fighting. 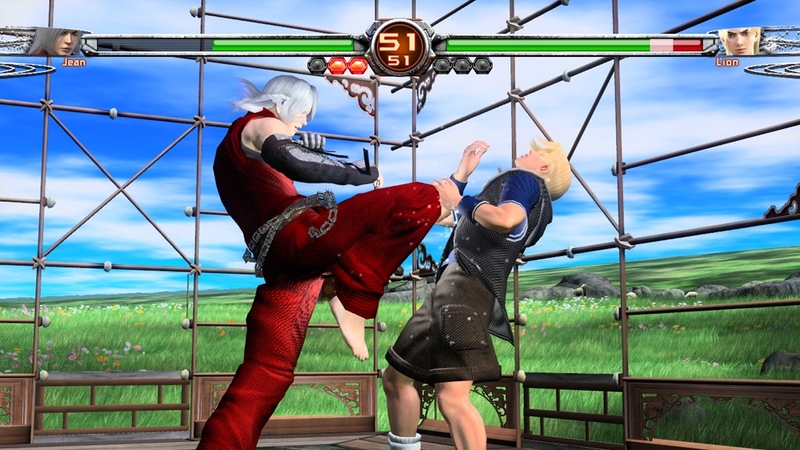 Ever since the release of Virtua Fighter 4 on the PS2, the VF series has been known for being the most technical fighting series ever and that point still comes across in Final Showdown. 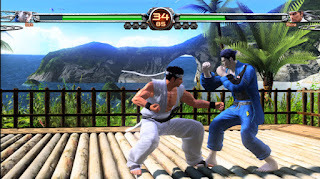 Virtua Fighter 5 vanilla became the staple of the 3D fighting game scene with its strong fighting game mechanics. 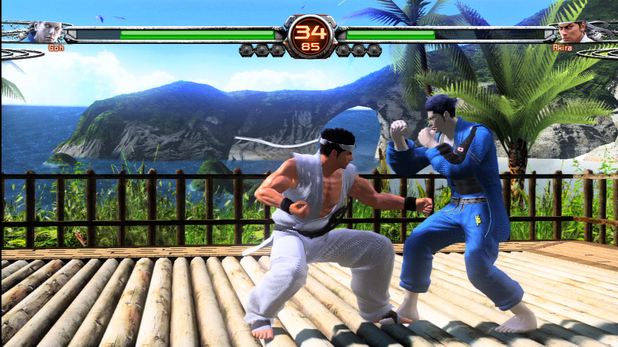 However, because of its highly technical gameplay, Virtua Fighter 5 made many gamers look away due to the difficult learning curve. With Final Showdown there were many changes made to the gameplay mechanics that would lessen the learning curve and make the game more accessible, but still retain the series’ high technical aspects for the veterans. There are still some moves within the character move list’s that take tons of practice like Akira’s rising knee attack. To help you on your journey to mastering the game, Final Showdown still offers the one of the best training modes out of all the fighting game out there. They offer 3 modes for the training dojo, a tutorial mode, command training, and free command training. The tutorial mode is pretty self-explanatory. Here you go thru a series of explanation on how to use Final Showdown’s gaming mechanic like side stepping, crouch dashing, and offensive stepping. The command training mode is a step by step for every character’s move list. This allows you to be familiarized with their attacks so that you can best optimize your options when fighting. The final training mode is the free command mode where you can literally do whatever you want. Here you have complete control and free range for practicing combos, situational moves, and strategies. New for Final Showdown is the ability to see your frame data which allows you to know what moves gives you an advantage or leaving you in trouble. One of the major changes made came to the throw escape system. Many characters like Jeffery or Wolf had some throws that done by pressing the punch and guard or all 3 action buttons. They simplified that by combining all their throws to just be punch and guard. They changed around the move lists of all the characters, taking out moves and replacing them with new ones along with new animations. All the new moves are heavily offensive based which help push the game to be played in a more aggressive manor than the previous iterations. Even the more defensive characters like Jeffery or Goh, have a more offensive based play style now. Other gameplay changes during combat are now in the stages themselves. Here you have a bunch of new arenas to fight but many of them have a twist. Some arenas now after every round can be enclosed with walls or open up allowing for a mix up in game plans. There are also the introductions of quarter walls which make it very easy to ring out an opponent or do some steady damage. Some of the other stages might just have one wall and or maybe three walls and an open area. There are even some walls that can be destroyed to allow for ring outs, which leads to all kinds of interesting scenarios. The new characters Jean and Taka are welcomed additions to an already rich cast of fighting styles. With their addition, they bring nice a balance between the cast since they too have some flaws that keep them from being overpowering. Jean brings his modern Karate which to be honest, I’m surprised took ten games (also counting all game variations like VF4 Evo to VF5R) to add a karate fighting style. Taka is a sumo wrestler, who actually first appeared in VF3 Team Battle but was dropped from the roster in VF4. With both new characters add a new flair to the already robust system in Final Showdown. Jean has a strong defensive style game but also comes with some guard break attacks, but most of his moves leave him at disadvantage to smart blocking opponents. Taka is a character with great reach and huge damage output, plus due to his size is not easily thrown but most of the cast. However Taka is slow and has very poor mobility which allows faster based characters like Eileen, Sarah and Pai to jab him out of most of his attacks. Aside from the major tweaks in gameplay, Final Showdown has a huge overhaul for the online component of the game. The net code for online play was improved upon significantly even though the code for VF5 vanilla on Xbox 360 was pretty good to begin with. When playing ranked mode, you now have the option of actually opting out of a match before it begins if you don’t like the connection you have with an opponent. That was something that was sorely missing in VF5 vanilla. Another thing that was missing and added were lobbies were multiple players could gather, chat and beat the snot out of each other. The system for playing matches is rather awkward but the ability to finally play in a room with up to 5 other people is a great addition. One of the things I am majorly unhappy with is the lack of the famous Quest Mode. This was a mode that was first introduced in VF4 and allowed you to go to multiple game based arcades. Progression thru quest mode helped improve your game play, gain ranks and allow you to gain items to customize your characters. Final Showdown doesn’t have that mode anymore. Why Sega would do something that I cannot begin to understand. If you didn’t feel like hearing online banter, putting up with lag matches, or can’t find better opponents to play, you had the Quest mode that allowed you to do that. Yes, you can literally improve your meta-game in Quest mode. Most of the higher ranked opponents were actually mirrors of top Japanese players from Japanese arcades. Now we don’t have that. In its place we have this lame License mode. The license mode has you trying to meet goals in combat before you can advance and upon completion of each level gains you a rank increase. Continuing on with disappointments, the graphics for Final Showdown are literally the same thing we saw in arcades over five years ago. They’re still very good looking, but there no new textures, no improvements to character models, and even the new stages look alright at best. Even when customizing a character, your characters still look like giant plastic mannequins. Character details are no were near as good as Tekken 6 or Soul Calibur 5, which have raised the bar. Even Dead Or Alive 4, which was an Xbox 360 launch window game has better textures. The arenas and stage backgrounds are very bland and generic looking. Here you have some large open areas where you are surrounded by ruins, beaches, water, nature and sometimes stadium crowds. There are only a few of stages that standout and they are the City stage, Sumo Ring and the Arena. The City stage looks great; you have a building on one side acting as a wall, the arena is fenced in, you see people and cars walking by, and the ground is wet and gives off a reflection. The Arena and Sumo Ring have a tournament feel to them. Here you have people actually looking on and watching you. The Arena is dark and looks just like something you would see in an MMA style match. The sumo Ring is packed with people, background posters, a large matted floor that shows wear and tear. Going back to the positive side of things, Final Showdown has a great soundtrack. In fact it has a collection of music that you can switch around. You can play a selection of classic music from earlier VF games or the music from Virtua Fighter 5 R. The musical beats are hard hitting and fit well with the intense combat. The voice acting however is a mixed bag. You have some characters that for the life of me really shouldn’t sound the way they look. Jeffery, Lion and Jacky all have some of the most obnoxious voiceovers I have ever heard while the rest of the cast seem to fit perfectly. And even for the characters where the voices work, the dialogue for before and after the battles are just plan goofy. In the long run however, despite the dated graphics or lack of a Quest mode, Virtua Fighter 5 Final Showdown is hands down the best 3D fighter out there to date. I totally recommend people pick this game up. Its combat is unparalled to anything you’ve ever experienced. The amount of depth, the toned down learning curve, the $15 price tag aren’t just the only reasons to get this game. Final Showdown is addicting to play and the improved online helps keep you drawn in.
? Why is voice acting so inconsistant Sega?